THE ethos of the craftsman in striving for excellence and the high standards he upholds in his work should be embodied in workers across all occupations - be it bus drivers, doctors or chefs. Individuals should take pride in developing expertise in their chosen vocations, as this will play a crucial part in improving and keeping Singapore's economy competitive, said MPs who spoke on the topic in Parliament yesterday. "This craftsman attitudinal mindset is vital if our economy is to thrive. This means setting the highest standards... Every one of us has to have the craftsman ethos in our work," said Nominated MP Eugene Tan. Professor Tan was among five MPs who commented yesterday on a point made by Deputy Prime Minister and Finance Minister Tharman Shanmugaratnam in his Budget statement. He had said that transforming the economy goes beyond a focus on the dollars and cents. It also means "changing our social norms". He highlighted that society should nurture a culture of job mastery in which workers seek "not just competence, but excellence". Underlining the importance of this mindset, Prof Tan said that even in today's knowledge-based economy, "a commitment to get a job done well, of continuing involvement to learning and the honing of skills so that the craft that we have is so deeply ingrained... (that) it becomes almost automatic" should be instilled. But this attitude has not necessarily been imbibed by younger Singaporeans, said Nominated MP Nicholas Fang, who feels that they lack passion in mastering their jobs. Mr Fang's lament was based on his encounters with young Singaporeans in the course of his work. Said the 38-year-old, who is an associate editor with Channel NewsAsia: "It is worrying to me that not all of them are passionate about becoming excellent at what they do, or mastering their professions. "More often than not, they place emphasis on the priority to work-life balance, a high salary or other benefits, and are quick to leave if they sense better conditions elsewhere." Mr Fang is also executive director of the Singapore Institute of International Affairs and founder of an athlete management agency. Ms Irene Ng (Tampines GRC) noted that it has become fashionable in some circles "to go around expressing pessimism for the future of our youth". She urged younger Singaporeans to have an optimistic outlook, which is necessary to succeed. Just as the previous generation "trusted a visionary government" to lead them through difficult changes to achieve progress, a similar trust "needs to be renewed" with the younger generation, she said. "This is no time for negative talk.. Not here, not today, not when previous generations have worked so hard to get us this far, and not when there is so much at stake," she added. Opposition MP Pritam Singh (Aljunied GRC) said a change in workplace culture is important to transform the economy. One way to achieve it is for bosses to value their workers' contributions and views. He suggested a "rigorous and sustained" public education effort could help workers be "more conscious" of and believe in their ability and power to effect change. Nominated MP Janice Koh puts great store on creativity if Singaporeans are to remain adaptable. "The ability to create, build and spread ideas is one of the most powerful tools for growth," she said, adding that "our ability to react, adapt and embrace challenges swiftly and with confidence requires creativity." CONCERNS raised by an MP that some young people lack the drive to excel do not get much traction with film artist Nor Azman Mohammed Rohman. Mr Azman, 28, knows that he cannot afford to let his standards slip for a second in his work at Lucasfilm Singapore. He can spend from a few hours up to several days poring over every detail of a film frame - "down to a single hair strand". Perfection, says the Nanyang Technological University graduate, is a "standard requirement", adding: "You have to have the patience to learn the basics properly and to get the fundamentals right even if it's boring, because that's the basis of what we do." That is why he "will willingly slug it out" in his early years to gain expertise. "Everything must be perfect. 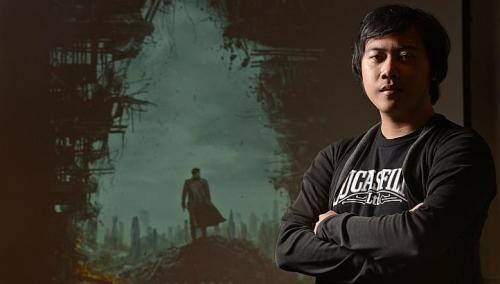 A regular moviegoer won't notice, but as a professional we have a standard to meet and it is imperative that we find perfection," said Mr Azman, who has worked on films such as Star Trek Into Darkness and Pacific Rim. His dedication to mastering his craft is a "timeless" value espoused by MPs such as Professor Eugene Tan during yesterday's Parliament debate. But Nominated MP Nicholas Fang raised concerns about the attitudes of some young people who were not passionate about excelling at work. Mr Azman said: "I think I was lucky that I had the benefit of knowing what I wanted from a young age. If you really want it, you can suffer through the tough hours. But I can see why some may job-hop - not for a lack of trying but to find a work-life balance and financial stability to feed their families."